My name is Tony Edwards. I've been a musician all my life - not always a guitarist and bassist, but a drummer originally and more recently a Hammond player. Back in the 80's, in rural England, good guitars were expensive. Most of us cut our teeth cobbling stuff together from 'junkers' we found in second hand shops. My first job was making something decent from a 'Satellite' Les Paul copy. It was terrible, but it was a good place to start. Through the early 90's I was bolting locking trems onto cheap strat copies, chiselling holes for Humbuckers, refinishing guitars with rattle cans - anything to get the next guitar ready to gig. After a while, I found myself in demand from friends for setups and repairs. After a couple of stints away from the music business, and in real industry, I opened a teaching studio in 2005, mainly teaching Guitar and Drums. As soon as I had a room to work from, the guitar repairs started rolling in too. Then I took on some customisations, and some custom 'parts' builds and a restoration or two. By 2009, I was making a solo album for the first time. I took a whole heap of guitars into the studio looking for different sounds. But I didn't have one guitar for the road - the one that I'd trust for anything, that had an individual tone. So I sold my Les Paul Custom (that I'd lusted after for over 20 years), and put the money into some basic tools, wood, hardware and electronics. The No.1, the old beast, was born. I still play it live to this day. But I had the tools - so why stop. I made two juniors, both sold quickly. Then a MkII model, two more of these were quickly sold too. Then I started the 'custom' shop design process, designing individual guitars with customers which is what I've been doing almost exclusively since. 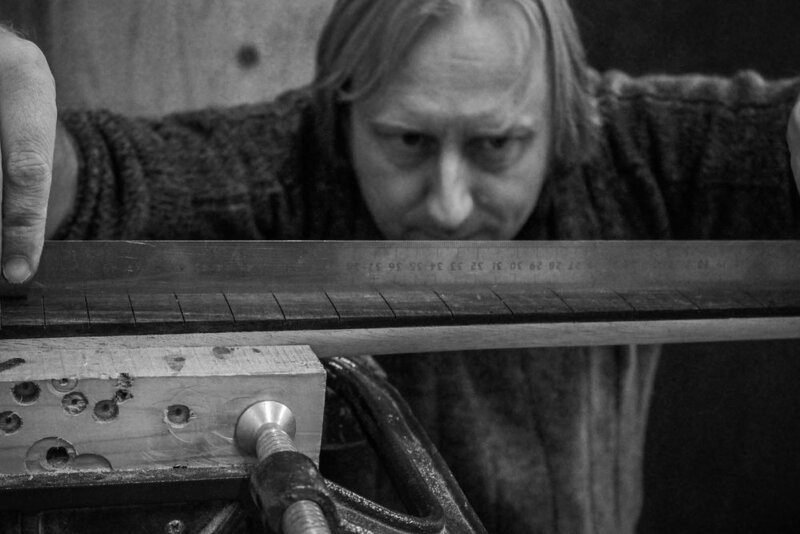 My philosophy about building is one of returning very much to hand tooling and traditional methods where possible. I don't like routers much (even though I have to use them for some things), but where I can I'll carve by hand. The machine tools in the workshop are few, and used little. My instruments don't feel like factory built guitars. 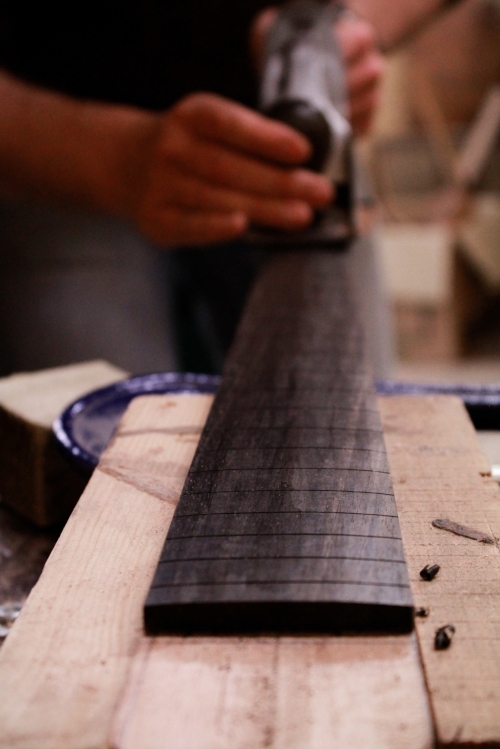 Oiled or thin Nitrocellulose finishes, neck sizes carved to your hand, pickups chosen to your specification. There is no 'one size fits all' - design is a collaborative process with the customer. At the same time I like to promise you absolute value for money, so you feel you get as much guitar hand built as you could off the shelf - but exactly what you really want.